BEATTYVILLE, Kentucky - Malcolm Kilduff, the White House spokesman who gave a shocked world the first official word that President John F. Kennedy had been assassinated, died Monday. He was 75. Kilduff was found to be unresponsive at a Beattyville nursing home Monday morning and was transported to Jackson Hospital, where he was pronounced dead by Breathitt County Coroner Bobby Thorpe at 5:10 a.m.
Thorpe said Kilduff suffered an aortic aneurysm which caused respiratory failure. Kilduff had been living at the nursing home. Kilduff more recently worked as editor of The Beattyville Enterprise, an eastern Kentucky weekly newspaper. But his biggest moment in the spotlight was at a 1:31 p.m. news conference Nov. 22, 1963, at Parkland Memorial Hospital in Dallas. "President John F. Kennedy died at approximately 1 p.m. Central Standard Time today here in Dallas," the young assistant press secretary told a shocked gathering of reporters. "He died of a gunshot wound in the brain." A short time earlier, Kilduff broke the news to Vice President Lyndon B. Johnson and his wife, Lady Bird. "I just gave my best shot, and I called him 'Mr. President,'" Kilduff recalled in 1988 for an Associated Press article marking the 25th anniversary of the assassination. "Lady Bird kind of screamed. ... She realized what I was saying." Fearing a widespread plot against other top-ranking officials, Johnson ordered Kilduff to withhold the announcement of Kennedy's death until Johnson was safely aboard Air Force One. Kilduff's place in the assassination story came only by chance. Kennedy's main spokesman, Pierre Salinger, was with a group of Cabinet members on a plane bound from Hawaii to Japan. It just happened that Kilduff was the ranking member of the staff in Dallas. Kilduff, who was riding in a press car a few cars behind the president, never doubted that Lee Harvey Oswald was the sole gunman. "I was looking directly at the guy on the `grassy knoll,' and he was no more carrying a gun than I was," Kilduff said, referring to reports that someone on a slight mound in front of the motorcade had fired. "The shots came from my right shoulder and above me," he said. "What am I looking at? The window of the sixth floor of the (Texas School) book depository." At the hospital, he recalled, he thought Kennedy's wounds might be serious enough that the president would be hospitalized for some time. He asked an aide to arrange for a press briefing room. "And it still didn't occur to me that he could be dead," Kilduff said. "It just never occurred to me. I figured that he was wounded." But moments later, he learned the truth from a doctor. Kilduff had a personal theory that Oswald was not aiming for Kennedy at all but was shooting at Texas Gov. John Connally -- who was in the seat in front of the president. 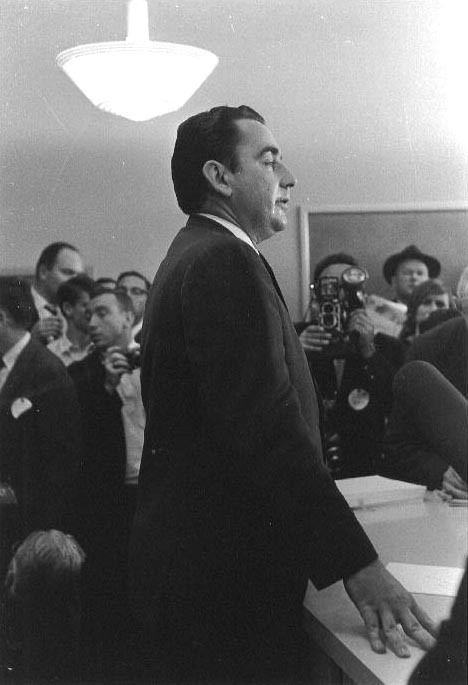 Oswald had appealed his dishonorable discharge from the Marine Corps to Connally, who served as secretary of the Navy before being elected governor in 1962. "He led his target," Kilduff said. "Had that motorcade not picked up in speed a little bit, he wouldn't have hit Kennedy on the first shot. He would have hit Connally." Kilduff left the White House press office in 1965 and held a number of media-related jobs. He was editor of the newspaper in Beattyville, his wife Rosemary's hometown, from 1983 to 1989. Until her retirement a few years later, Mrs. Kilduff handled the little paper's annual contribution to folklore: She predicted the severity of the upcoming winter by the color of "woolly worm" caterpillars. "They were very proud of life in Appalachia," said Charlie Beach Jr., a family friend who attended St. Thomas Episcopal Church with the Kilduffs. "It was quite a change transferring from D.C. to the town of Beattyville." Called "Mac," by his friends, Kilduff was well-known to the small town's residents and regularly spoke about his role in Kennedy's assassination, Beach said. "They were highly complimentary of him, his presentation, his savvy, his recognition and his recall," he said. After his wife's death in 1998, Kilduff moved into a retirement home, and later a nursing home when his health problems become serious, Beach said. Arrangements were pending with Newnam Funeral Home in Beattyville. DIED. MALCOLM ("MAC") KILDUFF, 75, former assistant White House press secretary in the Kennedy Administration; in Kentucky. Kilduff was the first to inform a shocked nation of the death of its President on Nov. 22, 1963, when he said, "President John F. Kennedy died at approximately 1 p.m. … today here in Dallas. He died of a gunshot wound in the brain." After Kennedy's assassination, Kilduff served as assistant press ecretary to Lyndon B. Johnson before resigning in 1965 to start his own public-relations firm.